Dry eye, medically known as Keratoconjunctivitis Sicca (KCS), occurs when the eyes cannot produce enough tears to keep the eyes moist and lubricated. The condition is mostly caused by an immune problem. Dogs with dry eye do not produce sufficient amount of the watery part of the tear, while the mucoid part is still being made. This results in a thick layer of mucoid discharge being collected in the eyes. 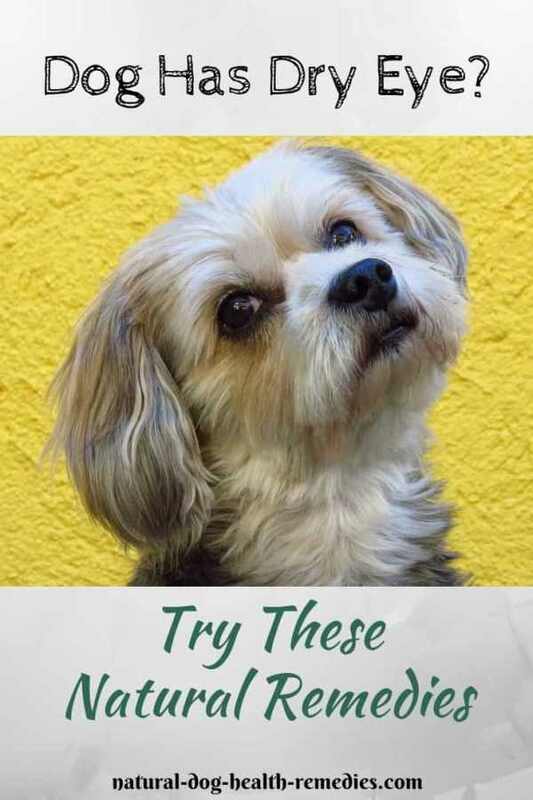 A dog with dry eye therefore has a lot of "gunk" around the eye, and very often because there is not enough water to lubricate the eye, the eyelid rubs against the cornea, making it look "cloudy". The dry eye may develop bacterial infections because there is insufficient tears to flush dirt and bacteria from the eye. What causes dry eye in dogs? What are the signs and symptoms of dog dry eye? 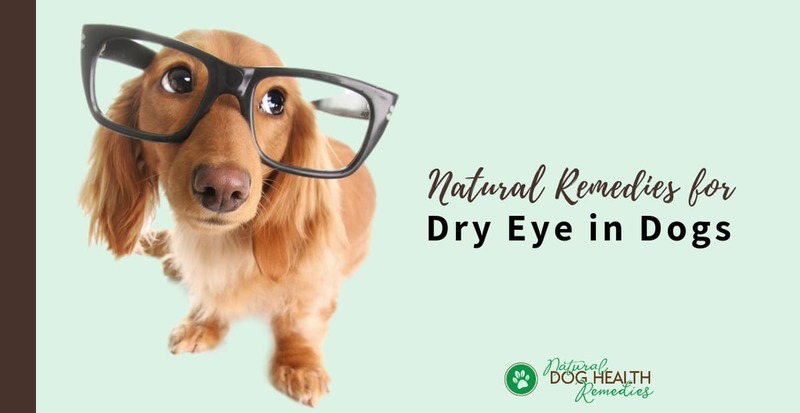 How to treat dry eye in dogs using natural home remedies? The watery layer of tears transports oxygen and nutrients to the cornea, flushes dust, and protects the eye from bacteria. The cornea has no blood vessels, therefore it relies entirely on tears for oxygen and waste removal. The superficial oily layer allows tears to slide smoothly over the eye, and prevents tears (made up mostly of water) from evaporating. The inner mucoid layer allows tears to flow smoothly; it also traps and binds material together making it easier to clear from the eye. There are quite a few possible causes of dog dry eye. One common cause is due to an autoimmune problem. The dog's immune T cells attack the tear-producing cells and prevent them from producing tears. If you notice any of the following symptoms in your dog, he may have dry eye. Be sure to go to your veterinarian for an eye exam. Failing to treat dry eye may lead to partial or complete blindness. The affected eye may look dry, dull, and "cloudy"
Natural home remedies include the use of herbs, homeopathy, and nutritional supplements to treat this eye condition. 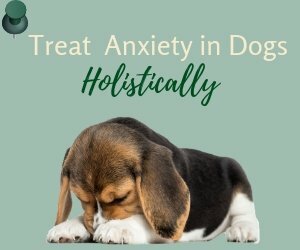 Many dog parents have reported positive results using homeopathic remedies. However, since dry eye in dogs is a chronic eye problem, homeopathic remedies is best used under the supervision of a holistic vet. The following remedies can be safely used in conjunction with other treatments to help speed up recovery of this eye condition. One simple way to help lubricate your dog's eyes is to use cod liver oil. Place one to two drops directly in the eye daily. Also, feed orally about one-eighth teaspoon per ten pounds of body weight daily. Cod liver oil is rich in vitamins A and D as well as essential omega-3 and 6 fatty acids. 10 drops of a tincture of one of these herbs: Calendula, Echinacea, Eyebright, or St. John's wort. To make the eyewash, add the salt to the boiled water. Allow to cool. Add the herbal tincture to the cup of water and use it as an eyewash for your dog. Eyes So Bright is a gentle natural eyewash formulated to cleanse pet eyes by safely removing debris and encrustations. In addition, it promotes healing of sore, inflamed, and infected eyes. It contains anti-inflammatory and immune-strengthening herbs such as aloe vera, goldenseal, echinacea, and gotu kola. This herbal formula contains a lot of herbs (such as Polygonatum, Lycium, Chrysanthemum, Rehmannia, White peony) that have been used for many years in China to treat numerous eye conditions. It is beneficial for such eye conditions as dry eye, eye infections/inflammation, conjunctivitis, etc.